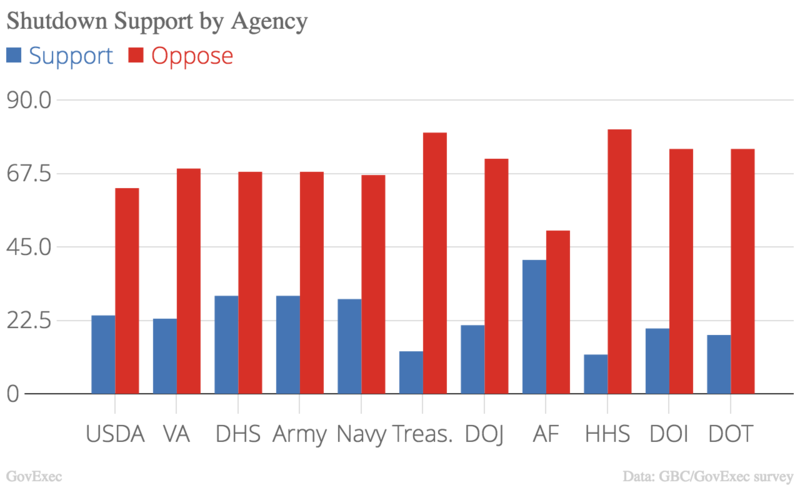 More than seven in 10 federal employees oppose the current partial government shutdown, though some civil servants support President Trump’s proposed wall along the U.S.-Mexico border so strongly they are willing to see agencies shutter. About 71 percent of federal workers oppose the shutdown—which crawled into its 10th day on Monday—according to a new survey by Government Business Council and GovExec.com, while 22 percent support it. Nine in 10 of those supporting the shutdown do so because they support Trump’s fight for wall funding, though a small handful feel so opposed to the wall that they want agencies to close in order to block the wall from being built. 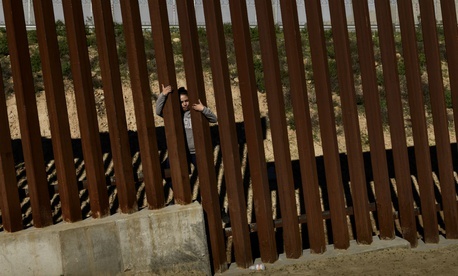 About 30 percent of federal workers support a wall, though 35 percent of those individuals say the means of a shutdown do not justify the ends. Overall, 15 percent of federal employees who oppose a shutdown support Trump’s proposed wall. 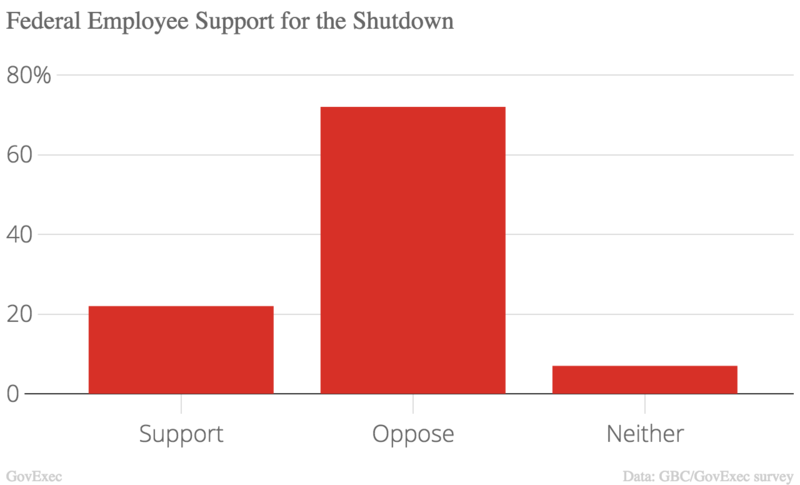 The findings come in stark contrast to President Trump’s claim that federal employees support the shutdown because they support the wall. Nine federal departments and a slew of independent agencies are currently closed, though nearly 500,000 exempt and excepted employees continue to work with only the promise of backpay. A new round of furlough notices hit inboxes on Monday and at least 340,000 employees have now been sent home without pay. The agency where employees are most opposed to a shutdown has already received full-year appropriations and is therefore unaffected by the current lapse: 81 percent of Health and Human Services Department workers are against the shutdown, followed employees at the currently shuttered Treasury, Interior and Transportation departments. The Defense Department is unaffected by the shutdown and employees at its components are more likely than those at civilian agencies to support it, including 41 percent of Air Force staff. About 30 percent of employees at the Homeland Security Department, which has been forced to furlough employees and which serves at the epicenter of the current funding standoff, support the shutdown. Democratic federal workers are nearly united in their opposition to the shutdown, with 90 percent against it. Republicans, meanwhile, are nearly split: 47 percent oppose it, while 44 percent support it. 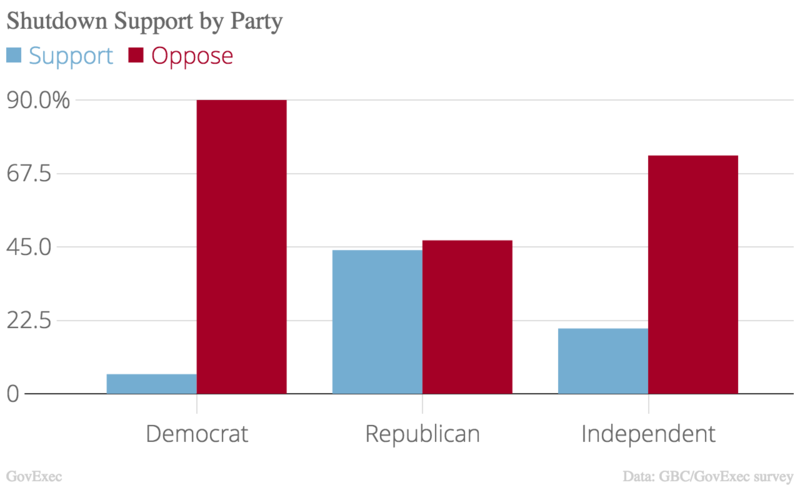 Nearly three-quarters of independents oppose the shutdown. More than one-quarter of federal employees are not very confident that furloughed workers will receive back pay once government reopens. The Senate has already passed a measure to ensure that happens, as it historically always has, but the legislation still must clear the House and receive Trump’s signature. Even those who so far have worked through the shutdown expressed concern that their status could change. Nearly one-in-five respondents said they are not currently furloughed but that could change in the “near future.” Agencies are expected to continue to increase furlough numbers as the shutdown drags on. Many of those who support the wall and the shutdown as a means to secure funding for it said their federal colleagues not on their sides were simply looking to preserve government waste. “As far as I am concerned anyone who complains needs to be fired, as just another useless government employee doing things not mandated by the Constitution,” said a Republican Air Force employee based in Oklahoma. One exempted USDA employee in Ohio said she would accept a furlough if she could instead go to the Southern border and help build the wall. Most employees, however, did not share those views. Many felt they were being used as “pawns” by the White House and punished so the president could fulfill a campaign promise. A DHS employee currently on furlough said he was embarrassed by Trump’s actions. Many employees said they are simply worried about their financial obligations and possible damage to their credit scores. Respondents said they have had to cancel vacations and return presents. Most federal employees received a check this week for work they completed before the shutdown and would see their pay interrupted only if it approaches the next scheduled disbursement on Jan. 11. Government Business Council and GovExec released the survey from Dec. 27-28, 2018 to a random sample of Government Executive, Nextgov and Defense One subscribers. The survey includes 1,435 federal employees and has a margin of error of plus or minus 2.6 percent. Correction: The graphic displaying shutdown support by party originally transposed results for Democrats and Independents, although the information was displayed correctly in the text. The graphic has been updated.